A (healthy) obsession for quality. 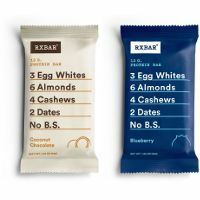 Yes, we make protein bars. But really, we’re in the egg business, and the date business, and the nut business. You get the idea. We keep things simple so the core ingredients are everything. We take a hands-on approach to ensure each and every product we put our name on lives up to our high standards for taste, quality, and nutrition. This is one of the best tasty protein bar. Lots of good ingredients that help build muscles. I just love the coconut chocolate and salty chocolate too. The best part my kids love it too.